This year, on the suggestion of my wife, I brewed a spiced Christmas beer with the intention of giving it away as gifts. I had an idea for a nice, dark, malty warmer that would feature traditional holiday spices; something that would hopefully be an appreciated celebratory brew. I sent my artist friend an idea for the label art, but to really make this beer special, I wanted to wax dip the bottles for that extra bit of "wow". To tell the truth, I've wanted to wax dip a set of beer bottles for a solid year now, ever since I first read Scott's excellent post on the subject over at Bertus Brewery. Be sure to give him a click and check out his top notch content; he deserves full credit for me being able to do this myself. I wanted my bottles to feature a bit of the Maker's Mark look - that effect where you get some run down of the wax from the bottle cap down onto the surface of the bottle itself. I don't know why, but that style of waxing really appeals to me; it just feels raw, authentic, for whatever reason. The secret to this effect is very simple to achieve; you simply melt crayons (which, of course, is the source of your wax) along with hot glue sticks. As I understand it, if you use wax alone, you get more of a "wax sleeve look" - which is nice, but is not what I was shooting for. The addition of hot glue makes the wax mixture thinner, and allows it to run just a bit, which yields more of that Maker's Mark look. I wanted to use medium to light purple wax, but I had no real sense of how many crayons I would need. A trip to Amazon revealed that you can buy boxes of a single color of crayon, but the closest match I could find was violet (which are dark purple crayons). I did know that it's pretty simple to mix wax colors; all you have to do is melt two (or more) colors of crayons, and the colors will blend nicely. To be honest, I was pretty sure that I'd be able to scavenge enough white crayons from my kids to sufficiently lighten the wax - after all, who actually uses the white crayons? I ended up purchasing two twelve count boxes of the large violet crayons (less than $5 each), as well as a one hundred count bag of mini hot glue sticks (less than $8). Ordering online not only gave me easy access to those single color boxes of crayons, but the pricing on the hot glue sticks was *much* better than I could have found at a craft store. Scott recommended a ratio of three glue sticks per crayon, but he was using regular sized crayons. My violet ones were fatter than normal, though my reclaimed white crayons were of normal size. 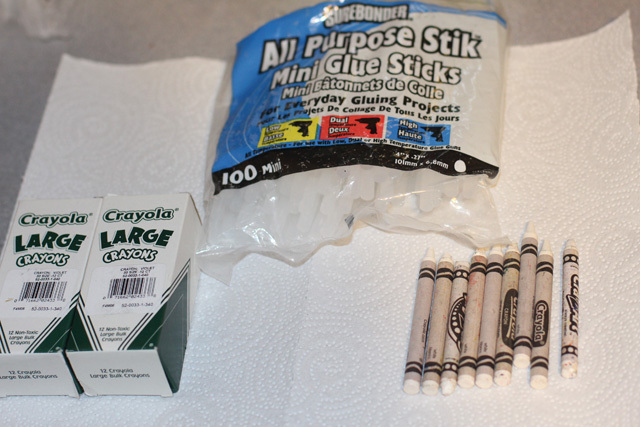 I ended up going with four glue sticks per fat crayon, three glue sticks per normal crayon, and one white crayon per two purple crayons (in an effort to get my wax color correct). Preparation was pretty easy. You need a container that can withstand high temperatures that you also don't mind getting waxy - half of a soda can works great for this. You will need to remove the crayon wrappers, which is done by making a lengthwise cut with a utility knife; the label then slips right off. You break each crayon up into three or four pieces, and use plain old scissors to cut your glue sticks likewise into three or four chunks each. 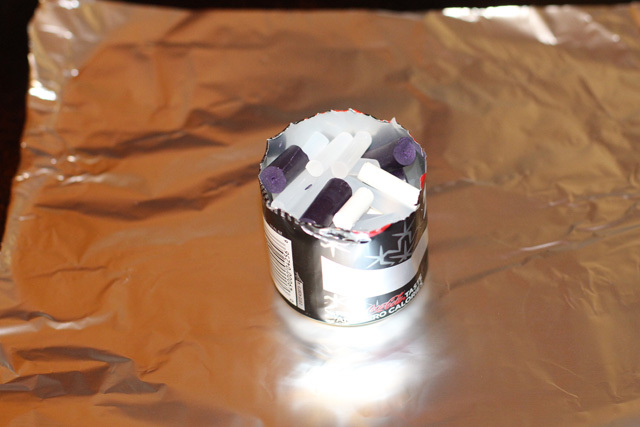 Drop your pieces into your can, stretch a piece of aluminum foil over a cookie sheet, and place your can on top. I figured that the foil would only be a precaution, but I could only imagine the look on my wife's face if I got wax on one of her nice cookie sheets - and lo and behold, the foil did prevent several such incidents. Skip it at your own peril! 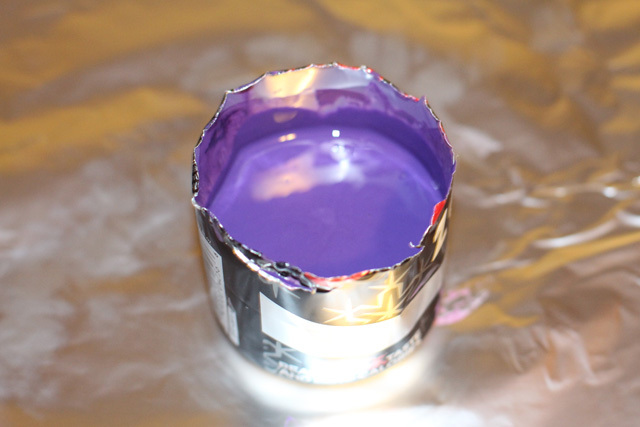 Heat your oven to 350 degrees F, then place your can containing the chunks of crayons and glue sticks into the oven. It takes close to half an hour to properly melt the contents, and you will need to stir it every ten to fifteen minutes. A plain old teaspoon works fine for stirring; I was worried about using one (see cookie sheet comment above), but the hardened wax does come off of the spoon without a lot of effort; you can slip a knife under it, and the wax will break off in large chunks. You will want something appropriate to rest your waxy spoon on after stirring; for me, the answer was another empty soda can. I made the mistake of placing my spoon down on a paper towel once, and had to strip off the paper-embedded wax before I could use the spoon again. It goes without saying that you need to be careful - wear oven mitts when taking your cookie sheet out of the oven, and wear an oven mitt to prevent you from burning your hand while you hold the can for stirring. Once your wax is evenly melted and thoroughly stirred, you are ready to start dipping. There is a bit of an art to this - I found that I got my best results by dipping the bottle into the wax down to the first "lip", pulling it straight up, then giving it a bit of a twist before placing it onto the countertop to dry. If you simply place the bottle upright immediately, you will likely get a lot more wax running down the bottle that you would like, but if you let too much of the wax drip back into your can, not only will you not have enough left over to run down at all, but the wax will have already started to set up by the time you place the bottle upright. I found that it took me four dipping sessions to handle two cases of beer, as I could get roughly a dozen bottles out of my half can of wax. At that point, I had to add more crayons and glue sticks, not to mention that the wax mixture began to lose a bit of viscosity by that point. Note that my dipped bottles were easily ready to put back into the box by the time that the next can of wax was ready for dipping; they take a few minutes to cool, but the wax itself sets up very rapidly. 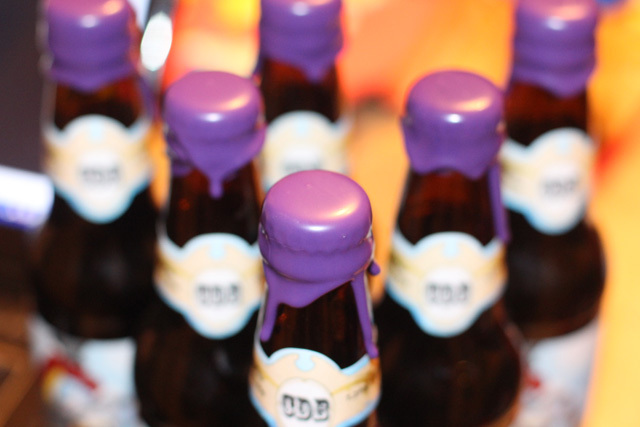 All told, I used eight large purple crayons, four normal white crayons, and forty-four glue sticks to process my two cases (48 bottles) of beer. I did end up discarding about a third of a can full of wax. This left me with easily enough leftover supplies to do wax dip two more cases of beer bottles, if I so desire; I have packed them away with the rest of my brewing gear, as I'm certain that this is something that I'll do again. 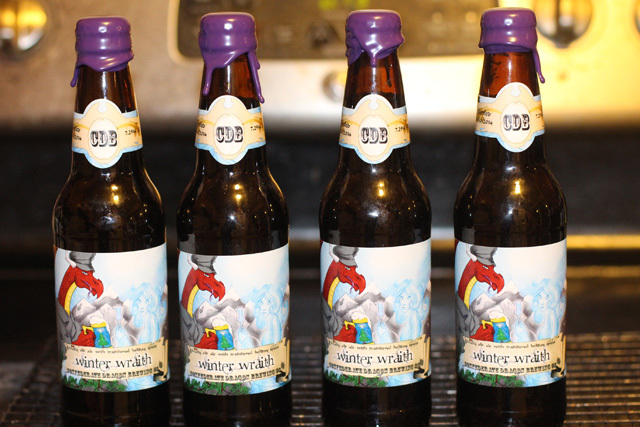 On that note, here are what my labeled, wax dipped bottles ended up looking like. To say that I'm pleased would be an understatement! Wax dipping bottles is easy, fun, and pretty satisfying. If you are looking to add something special to a batch of your homebrewed beer, you could do a lot worse. The wax breaks pretty easily with the aid of a butter knife, and it comes off in large chunks, so it's not that hard to open the bottles. Final aside: label artwork courtesy of Lori Krell. If you would like some killer label art of your own, give her a shout - Lori is available for commission. Really nice! That label is pretty sweet, too. Have you considered just using cheese wax? It's about $8/ pound. My LHBS has started selling it with the rising interest in cheese making. It has strong plasticity and can reused 3-4 times. I did this pretty much exactly how you described. The issue I ran into was that the wax cracked after drying on about half the bottles. Any thoughts on that, maybe my ratios were off or something? Maybe not enough glue in the mixture?